When the contest is over, you will need to prepare your Cabrillo log for submission. 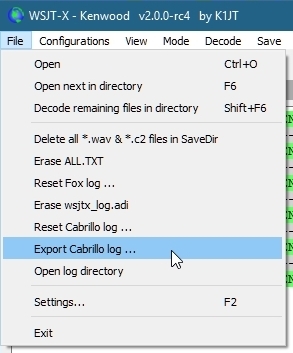 To create the Cabrillo log, select “Export Cabrillo Log…” from the WSJT-X File menu. The Export Cabrillo window will open where you will input important information. The window will be blank when first opened. Location: Location is your STATE or PROVINCE abbreviation. If you are outside the contiguous United States and Canada, you will input DX in this box. KH6 and KL7 stations will input DX. Callsign: Input the callsign used during the contest. Category-Operator: There are only three available options here – SINGLE-OP, MULTI-OP, or CHECKLOG. Category-Power: Enter LOW here if you ran 100 watts or less. If you ran more than 100 watts, then enter HIGH. If you enter HIGH here, but MUST enter CHECKLOG in the Category-Operator box. Category-Assisted: Since everyone is allowed to use the Packetcluster in this contest, you can enter ASSISTED or NON-ASSISTED here. It doesn’t matter. Claimed Score: Either leave blank, enter 0, or enter the score you claim. Since WSJT-X does not calculate a claimed score, it doesn’t matter what you put here. 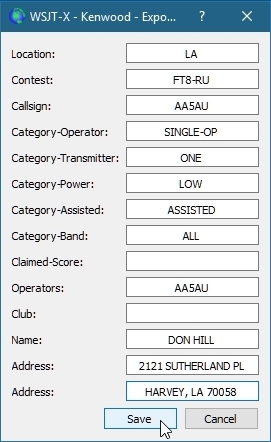 Operators: Enter the callsigns of all operators who operated the station during the contest. Club: You can leave this blank. There is no club competition in the FT8 Roundup this year. Address: Enter your address in the last two boxes. 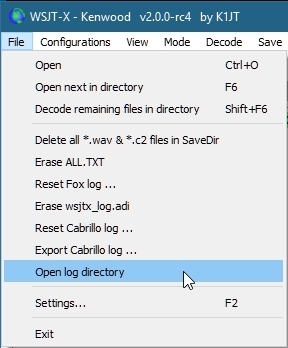 When the log directory opens, you will see your Cabrillo file listed. If you like, you can copy it from this location and place it into a folder that’s easy to access. You can now email this file to ft8-ru@cqww.com. When composing your email, put only your callsign in the Subject line. After you send the log, you should receive email back from the robot. A Logs Received Page is now available where you can see if your log was received. Thanks for participating!